High culture refers to a set of artistic products held in the highest esteem by an elite culture; usually aristocracy or intelligentsia. It is contrasted with popular or low culture, which supposedly appeals to the less educated, or “the masses” (Storey). The term “high culture” first appeared in Mathew Arnold’s Culture and Anarchy, where he described it as “the disinterested endeavour after man's perfection”; arguing that that having culture meant to “know the best that has been said and thought in the world” (Storey). Arnold also argued that it was a force for moral and political good; inextricably linked to philosophical thought (Storey). High culture is primarily of an appreciation of “high art”; encompassing literature, music, painting, theatre, and most recently cinema. The American critic Harold Bloom championed the idea of a Western canon; that is, works of high art which have been of great importance in influencing Western culture. This line of argument was derisive of popular culture (Bakhtin). It also excludes the work of Asian artists, such as director Akira Kurosawa. Historically speaking, products of high culture are more likely to be produced during periods of high civilisation, within a wealthy and sophisticated urban-based society (Bakhtin). Examples of this within Western canon are the Greco-Roman tradition and the Victorian era. Japanese cinema, following its defeat in World War II, is an exception to this rule. The 1950s is widely considered Japan’s golden age of cinema (Mellen). Akira Kurosawa’s Seven Samurai and Rashomon, as well as Yasujiro Ozu’s Tokyo Story, are highly regarded in the West. They have appeared on the Sight & Sound’s 2002 Critics and Directors Poll for “Best Film of All Time” (IMDb). Popular culture refers to the ideas, images and attitudes that are preferred within the mainstream culture of a given society. Like high culture it encompasses literature, music and film, but as the name suggests, popular culture is far more prevalent in lives of everyday people, and is heavily influenced by mass media (Hartley). Although movies have found appreciation and analysis within high culture, they permeate far deeper into popular culture. There are several competing definitions of popular culture. John Storey dissects several theories in his book, Cultural Theory and Popular Culture. He argues that popular culture is mass culture – “mass produced for mass consumption” (Storey). In other words, high culture is art, popular culture is entertainment. Of course he also acknowledges that some works have appealed to both audiences, such as and Charles Dickens and William Shakespeare (Storey). Even more cynically, Storey defines popular culture as “the left overs”, once works of high culture have been established. Offering a more optimistic view, T. S. Eliot talked about high and popular cultures as necessary parts of a complete cultural discourse (Bakhtin). He added that popular culture provided the perspective of working-class people, while high culture tended to focus on people of wealth and privilege (Bakhtin). Each work is concerned with the cultural experience of diverging classes. 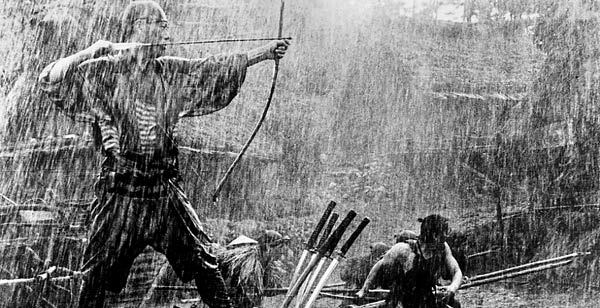 Seven Samurai is an excellent example of high culture, as it introduced several structural innovations to Western and Asian cinema. It was the first film to feature the recruiting and gathering of heroes to accomplish a specific goal. This now-common plot element was used in later films (Mellen), such as Ocean’s Eleven, The Dirty Dozen, and Guns of the Navarone. It also included other plot devices—the reluctant hero; the nervousness of the commoners; and a romance between the youngest hero and a local woman—which are now a staples of visual narrative. The plot of Seven Samurai has also been remade into several different genres, including Western (The Magnificent Seven); Sci-Fi (Battle Beyond the Stars); Action (Mad Max 2); and Animated (A Bug’s Life) (IMDb). In conclusion, high culture and popular culture, as argued by Eliot, are equally important elements in the cultural milieu of a society. They can each offer different perspectives on a wide stratum of cultural experiences.